As a frequent business traveler, I dreaded the (capital S) Sequester for how it would affect me - as if I was motivated by my own self-interests. But I'm not the only one. We are a nation of the "self-interested" and this a perfect example. 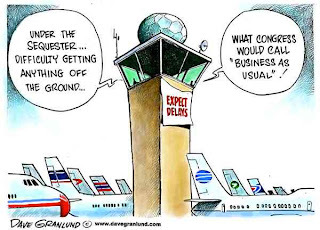 The considerable cuts and furloughs continue, with one exception: air travel. 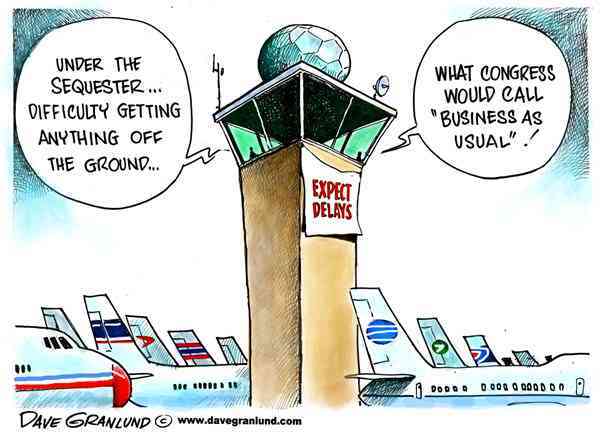 The FAA furloughs for air traffic controllers have been suspended by government intervention. I expected something like this to trigger the end of the (capital S) Sequester, but those pesky congresspeople found a way around that too. They managed to get only this one element of the Sequester fixed, not many of the more important social programs (Head Start, Meals On Wheels, Cancer Research). You know why? Because congressfolk need to get home to their states and districts. For that they could all agree to move the meter... Because they are the paragon of this self-interested nation. As it turns out we were delayed 2 hours from Atlanta to Baton Rouge on this clear April Saturday, because of something called "maintenance." Conspiracy theorists populate my gate, although I didn't recognize a single politician. The news outlets had been promoting the Sequester with a capital "S" for months. We had heard all about the draconian drama that was about to unfold before our eyes: Cuts, furloughs, closings, and more cuts. Yes, I was sure it was just another fire drill - until it affects you. And by "you" I mean me of course. The FAA has been hacksawed into, which means fewer air traffic controllers, which means less air traffic control, which means less air traffic. Homeland Security has been slashed as well. And while nobody is writing love songs about TSA agents, if their overtime gets cut and if they can't hire new personnel for a fairly high-turnover position, the process of airport security will be slowed down to a crawl. If you make your living flying from place to place, this is very ominous. If you make your living connecting through a hub like Atlanta, O'Hare, or DFW, expect things to be a lot worse. Not only is the population exponentially higher than other airports, but double the headaches with the comings and goings of connecting flights. So when I'm in ATL this coming Friday, on my 8th drink at Cafe Intermezzo, waiting and wondering how this all started, I thought I'd be sure what to tell my fellow refugees about why we're in this soup. This is initially the Republicans' fault by ignorance, then the Democrats' fault for stupidity. The two are not the same. In 2011, when the GOPs in Congress stubbornly blocked a perfunctory raise of the debt ceiling, all hell broke loose. Many of them did not know (or at least their constituents didn't) that the debt ceiling was there to pay off the country's standing debt, not raising the debt limit a la credit cards. So a deal had to be brokered to keep the US in good financial standing. The Dems caved on a "sequestration" deal, which is what you see today with the massive cuts to essential programs. They never thought the Republicans would let it go into effect, which was a colossal miscalculation. They thought this because the deal included major cuts in defense spending, a sacred cow on the right, while not cutting Social Security and Medicare, the equivalent on the left. The problem is that hard-line military spending was the GOP platform of the neo-cons a decade ago, post 9/11. It's not the same in this decade, post-Tea Party. The party has transformed - now they'll cut anything and call it a win. In the meantime hundreds of thousands of Americans will feel direct pain, and then so many more of us, like the business travelers will feel the residual effects. That's when this will reach a tipping point and Congress will have to act.